Paty will be closed for the 2018-2019 academic year due to renovations and will reopen in 2019-2020 as a co-ed hall. Please consider Parham or Burke East if you are interested in an all-male, traditional hall. Home to the Commerce and Business Administration (C&BA), Paty offers residents a fully furnished double-occupancy rooms with community bathrooms. 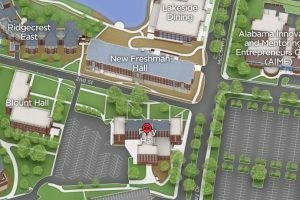 The hall is located near on-campus dining options, Raising Cane’s, which is located on the first floor, Lakeside Dining, and the Ferguson Student Center. Residents have access to 12 study rooms as well as the 1st floor game room and 1st floor laundry rooms. Students are responsible for providing their own trash receptacles, cookware, eating utensils, and cleaning supplies. Gallery currently unavailable due to ongoing renovations. Paty is currently undergoing renovations. Updated room specifications coming soon!